Recently a friend asked me how in webmethods, she could fire linux specific utility tasks. She wanted to find out if the disk space is full on linux. This can be done very easily by the “df- kh” command. But how to invoke this through webmethods? Solution: Follow the steps below. 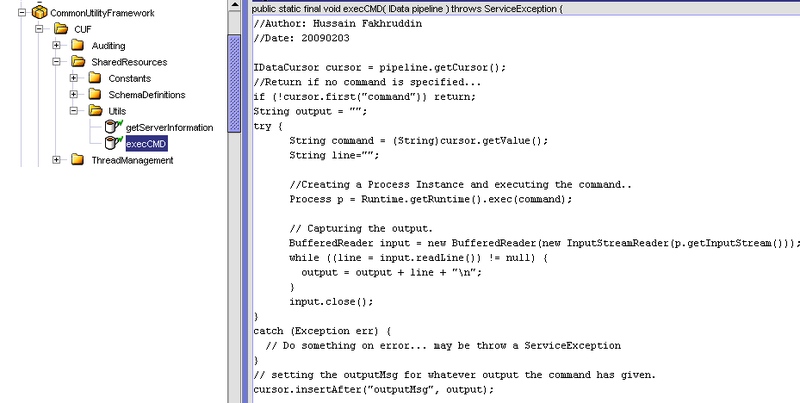 //Creating a Process Instance and executing the command..
// setting the outputMsg for whatever output the command has given. Note: DO NOT use commands which are not exiting after giving an output. For example “tail -f” . This service is only for commands like “df -hk” or “cp file1 file2” or “pwd” or “ls -lrt“. If you face some issues, do feel free to write back. This entry was posted in code, webmethods on February 3, 2009 by Hussain Fakhruddin. 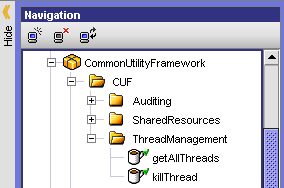 The Common Utility Framework or CUF is a set of utility services created by any enterprise for their internal usage. These utility services form the backbone and will provide a set of APIs to the applications which will be written for any enterprise solution. The major advantage of using a CUF in your enterprise solution is to have a common standard implemented with respect to change of human resource in any organization. A CUF should be responsible for everything which is used again and again and a programmer doesn’t like to code for it. All extra work which is most necessary but one doesn’t want to waste time in implementing it should go inside CUF. Say you have a long process; you break it down and want to insert logging of the process as checkpoints. You really need some good utility to log all of this. Apache log4j is a good thing, but it needs to get into your CUF so that all other application can access it easily. You just need some general debug logging, or any other log. You may want to put the logs on files or database. It depends on your organization. There should have varied levels of log. How much data you want to capture? There will always be happy path and sad path, what to do in that case? A common framework to handle common exception scenarios. You may want to log these errors. The best practice is to create a generic handler for all common exception. System Errors –Internal Errors, Mis-configuration, Database errors, Timeouts etc. Business Errors – Component or Application Errors related to resources, processes, static data etc. Error levels – Critical, High, Medium, Low etc. Alert levels – Whom to escalate, what level? Escalations procedures – FIX, Root Cause and Prevention mechanism. For example –Retry from start, retry from last error checkpoint etc. What medium to use for notification? To initialize a data feed. To initialize a pool of objects etc. Locking mechanism: A set of common locking mechanism for shared services. To ensure concurrency at service call level. May be a custom garbage collector on the service level. For example, if a service has been running for more than X hours. Where X is max limit, it should get killed. 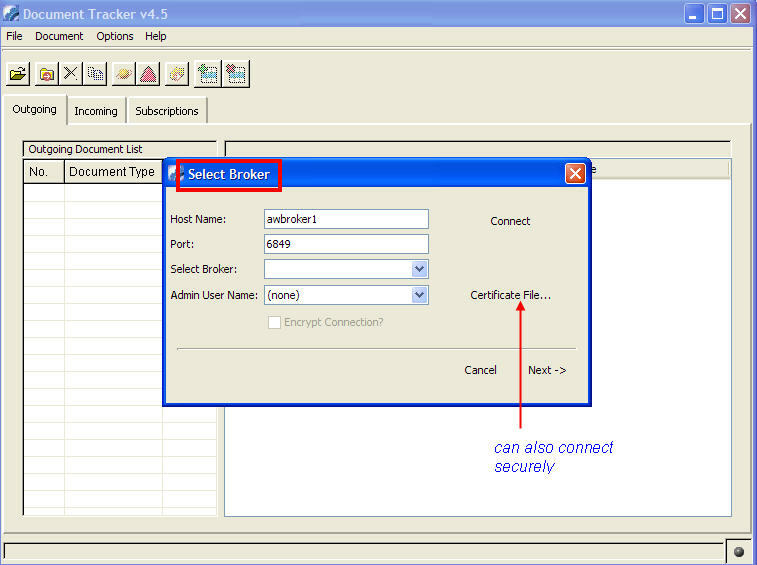 A common database pool of database and adapters which can be used as shared resources. A message driven middleware or JMS/EMS shared adapters to PUB-SUB messages. 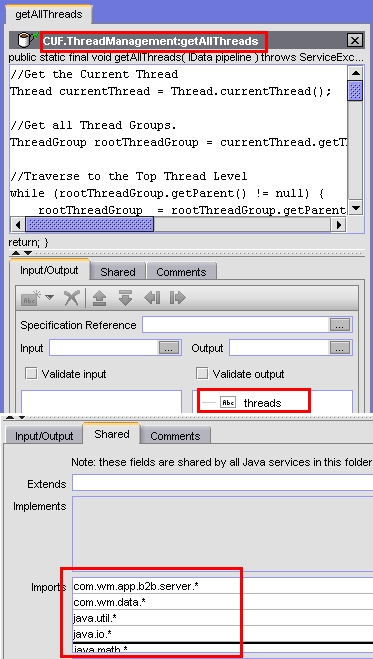 Manage service calls, Thread Management, Interrupt and reset shared object pools. As a conclusion –A CUF should be responsible to make life easy. There are hard and fast rules or concrete standards that organizations should follow but the above points should help you getting started to have CUF implemented at your enterprise. This entry was posted in webmethods on January 6, 2009 by Hussain Fakhruddin. WebMethods and Tibco are the two most popular Enterprise Application Integration tools in the market today. Lets look at some technical details to bring out the differences between them. If you understand EAI, you’ll probably understand Hub and Spoke Architecture and Bus architecture. WebMethods is Hub and Spoke Architecture and Tibco is Bus architecture. Bus architecture is like a data bus connecting and serving data to all the applications connected to it. One has to imagine many practical scenarios before one can perfectly avoid confusion between the two. WebMethod has a product called Broker Server. This is their way of implementing JMS ‘kind of stuff’. I say ‘kind of’ because it can be used easily only with webMethods Integration server. Other data can be exchanged only through some extra wrappers/adapters. On the other hand Tibco came out with a complete 100% JMS implementation which they say is written in C(and they also claim that because its written in C, its faster – I have doubts). The product is called EMS. One can create queues and publish and subscribe to it. Tibco is quite good at these. You can send and receive just any XML or data by defining a schema. Hats off on that.. In Webmethods, each module or project is represented as a package. Each package may have functions called flow services. These can be invoked by other packages residing on the same Integration server. A package can contain their own flow language code(which is in XML). This gets converted internally into Java code. 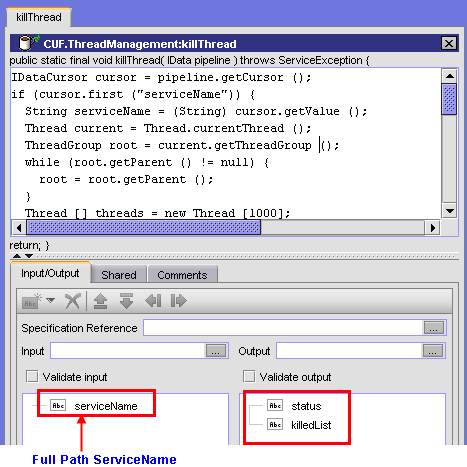 A Java service will have pure Java code. Tibco deployment is more like a Enterprize archive(EAR). You need to pack all your compiled code and then deploy to the server(called BusinessWorks Engine). This can sometimes be problematic because we have to have our own version control system, whereas webmethods has it inbuilt. Webmethods has a centralized server where all the code is deployed. This is called an Integration Server. An integration server will also contain their built in services. Tibco on the other hand has the product called BusinessWorks. EAR files are deployed on the BW engines to work out the trick. At the end, I feel both are nothing but tweaked tomcat servers!!! Tibco has a concept of pallets. These pallets are also some small function. But the implemennntation is done in just one city! Whenever a data comes to the Broker from an Integration server or rather say, webmethods Broker receieves a Queue, then a Trigger is called. These triggers in WebMethods do nothing but call another service[built-in or custom built]. JMS implementation of TIBCO called EMS does a delivery of the message(JMS message -Remember it can be anything!) to all the clients who have subscribed to the Queue. Developer is for Webmethods. Its a java (old fashioned look, revamped in new version) based IDE which connects to IntegrationServer and allows you to ‘drag-n-drop-programming’. It gives you options to watch variables, debug, step through etc. 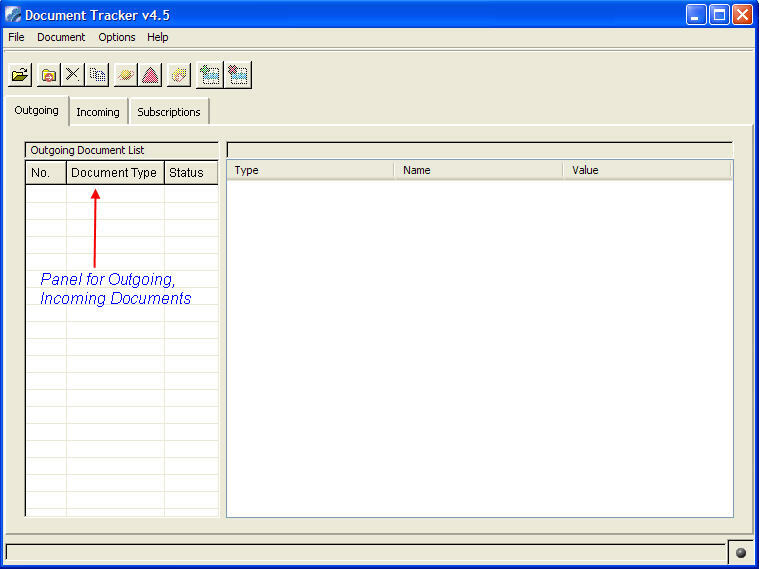 Tibco Designer – This is also a Java based tool which allows you to create your processes. You have have predefined template (basically a folder structure) for a new project and build everything accordingly. It gives you options for testing/debugging with breakpoints etc. Webmethods uses a language called Flow Language. A flow language consists of simple programming constricts like looping, branching, breaking etc. A flow service is written in Flow Language and comprises of Flow Steps(instructions ). Everything is drag and drop with some basic property setting such as Input/Output and pipeline variables. Tibco implements everything like a flow chart. There is a canvas where start and stop end points are given. We can drag and drop existing processes and connect them with flow lines. These flow lines carry data with them in its pipeline kind of implementation. It has to be noted that Webmethod’s earlier version (say around 3-4) had a similar interface what Tibco has it today. Further to that, Webmethods 7 interfaces have changed a lot from webmethods 6. Software AG acquired Webmethods and has a revenue around 200mn. Whereas Tibco has a revenue of 500mn. (Figures from wikipedia). I personally believe that Tibco markets its product quite well. They also have a good grip on open source community by sponsoring DWR and TIBCO GI projects. Current trend goes towards Tibco because of their wide range of products and excellent marketing. But webmethods is not a bad software too! There are more resources available for webmethods (advantage website) than Tibco. I strongly believe one doesn’t need an official training to get started(offcourse yes! for advance stuff) but you’ll find more webmethods trainers than Tibco in the market. Support wise, I feel both are same – somewhat useless. Support now a days is just the name! But both release patches etc etc. Cost – Depends again on the deal your crack with those guys. They don’t release the prices on their sites, which means they see you first(check your spending capability) and name the price!! 1. Cost – The deal you crack with them? 3. XML based or can work with Documents ? Factors which shouldn’t affect your choice. 4. One performs better than other – Trust me , Ive worked with both and performance is programmer’s responsibility not framework’s! This entry was posted in tibco, webmethods on December 25, 2008 by Hussain Fakhruddin.